Navigating ACA Tax Credits to Purchase Affordable Health Insurance - Can I Retire Yet? A massive challenge for Americans planning to retire early is determining how we’ll obtain affordable health insurance. The earlier you want to retire, the more challenging it is to determine how much you need to bridge the gap until Medicare eligibility at age 65. Health insurance costs increase faster than the rate of inflation. Medical expenses also tend to rise as we age, reflected in higher insurance premiums for older individuals. The Affordable Care Act (ACA) provides tax credits for low income households. Your health insurance costs depend on how you are able to structure income in early retirement. It is vital to understand the rules. While these facts present challenges, careful planning can meet them. A tougher planning issue is the lack of political stability in the system. If the health care system changes substantially, any projection of health care expenses until we become Medicare eligible would be nothing more than a blind guess. Projected savings needs could be off by six figures in either direction. The upside to this approach is that it allows us to start our transition to early retirement sooner. The downside is we have to take measures to insure we can continue to earn income in a manner that is consistent with our desired lifestyle. Earning income can also make our insurance more expensive. Open enrollment has started and continues through December 15. Assessing health insurance options is a tedious and confusing process. However, it allows me to provide insights and resources to assist your planning. Each situation is unique. It is impossible to cover every scenario for every individual or household. I’ll share our decision process and resources we found useful to estimate our health insurance costs. This framework and these tools can be applied to your own financial situation, risk tolerance, and assessment of stability of the marketplace. We have yet to purchase our medical insurance on the open marketplace. We had medical insurance through my employer until I left my job last December. Over the past year, we’ve obtained insurance through my wife’s employer. They pay 80% of premiums and employees pay 20%. The cost for our family of three is $235/month in 2018. We would actually see a slight premium decrease in 2019 to $218/month, or $2,620 for the year. This plan comes with a $2,000 individual and $4,000 family deductible for the plan year and allows us to contribute to a Health Savings Account (HSA). When comparing options for buying health insurance through the exchange, I focused on Silver Level Plans because they were most similar to what we currently have. They also offer the most generous subsidies for those looking to optimize costs. For lower income households, Silver plans are the only option that also offer cost sharing reduction. This is a discount on deductibles, copayments and coinsurance in the event you need care. We like several features of obtaining our insurance through an employer. Insurance is affordable and we have a fixed cost, regardless of our income. We are also able to control our downside risk in a worst case scenario. This is ultimately the purpose of having any insurance. Suffering a major injury or illness without adequate insurance would cause serious financial hardship for all but the most wealthy. Having seen worst case scenarios hit close to home, I know it is not difficult to accumulate massive expenses with serious and/or chronic conditions. My wife is required to work at least 30 hours/week to obtain health insurance through her employer. She currently works 32 hours. Working less than that would mean forfeiting that benefit. We would have to buy our insurance on the open marketplace or seek an alternative to traditional insurance. She has been considering cutting back her work to closer to 25 hours/week. This would fit nicely with our lifestyle. With flexible work conditions, work she enjoys and location independence, she doesn’t desire full early retirement. Therefore, the decision for us is measuring how much quality of life would be improved by her having an extra day off each week versus the costs and and/or risks we would incur by purchasing medical insurance on our own or seeking an alternative to traditional insurance. Buying insurance through healthcare.gov (or your state’s marketplace) guarantees access to health insurance similar to what we always had available through our employers. There is a lot I don’t like about our current healthcare system. That said, I find comfort in familiarity. An ACA compliant plan allows us to have contractually binding health insurance that protects us in a worst case scenario. The issue is determining whether it is a good value proposition. 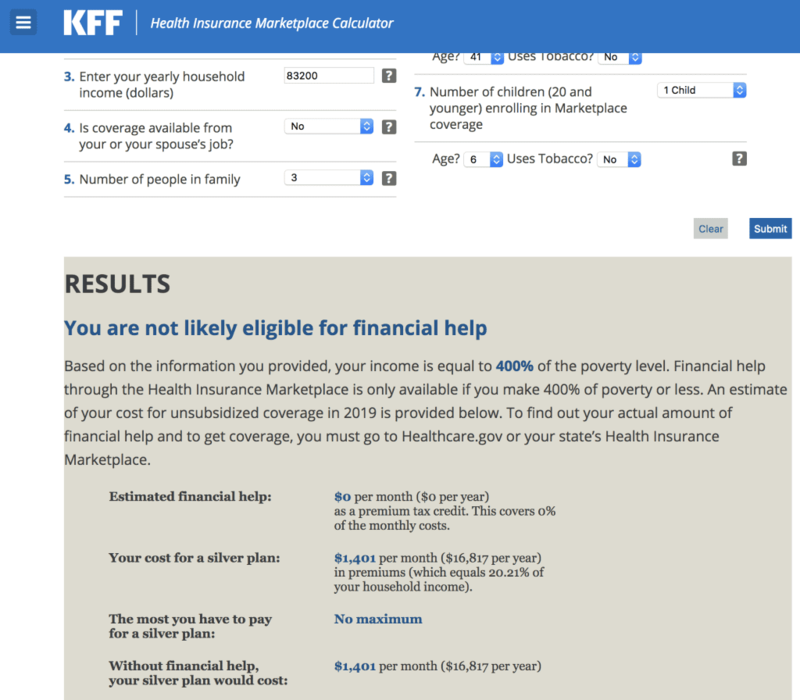 Using the Kaiser Family Foundation’s Health Insurance Marketplace Calculator allows you to get a close approximation to what health insurance would cost based on income, age, geographic location, family size and whether or not you are a smoker. The price you actually pay for health insurance and care when buying through the exchanges is dependent on the amount of premium tax credits and cost sharing reductions received. These tax credits are dependent on your Modified Adjusted Gross Income (MAGI). Therefore, we need to understand what is included in MAGI to determine how much insurance will cost. MAGI includes earned income from a job, tips or self-employment. Most sources of investment income including interest, dividends, capital gains, rental income and royalties must be included. It also includes other sources retirees may rely on for income such as Social Security, IRA/401(k) withdrawals (or amounts converted to a Roth IRA), and pensions. You must also include alimony and disability income when calculating MAGI. If we chose a traditional retirement (no work and no earned income) and maintained our current investment strategy in our taxable accounts, focused on broad stock market index funds (limited dividends, no interest, minimal to no capital gains, no rental or royalty income), we would be able to have great control over our MAGI. We could obtain insurance for less than we ever paid when obtaining our insurance through employers. You need to have a MAGI of at least 100 to 138% of the federal poverty level (FPL) to receive subsidies and avoid being pushed into Medicaid. The level depends on whether you live in a state that expanded Medicaid. Avoiding Medicaid is desirable for most people, because it is not accepted by many providers. Income that counts toward MAGI could come from a combination of dividends from taxable investments, capital gains incurred by selling shares from our taxable portfolio, earning small amounts of income, and/or performing Roth IRA conversions. This would allow us to qualify for ACA subsidies and avoid being forced into Medicaid. Other spending needs above the FPL could be met from basis in taxable accounts, cash from savings accounts, or Roth IRAs. None of these sources are factored into MAGI, and thus would not affect subsidies. We could then maximize our premium tax credit and pay only $82/month and receive a tax credit of $1,320/month. In this scenario, we could get health insurance for our family of three for only $982 for the year. We would receive $15,836 in tax credits. This compares very favorably to my wife working 30 hours/week to qualify for employer subsidized health insurance. We pay $2,620, while her employer picks up the remaining $10,480 of premiums. Relying on tax credits to keep health insurance affordable introduces political risk to your plan. It’s important to understand the full price of an insurance policy. The difference in premiums between the total cost of insurance vs. the subsidized amount is about $15,000/year in our optimized example. I experimented with the Health Insurance Marketplace Calculator to project what insurance would cost if we were 20 years older. I would be 62, my wife would be 61, and our daughter would be 26 and presumably not on our insurance. The unsubsidized cost for the two of us in that scenario jumps to $26,067/year. The optimally subsidized cost would drop to only $67/month. Relying on subsidies makes early retirement feasible far sooner. However, this assumes these generous subsidies will continue to be available. John McCain’s 2017 iconic thumbs down vote for a proposition that would have gutted the ACA reminds us how different the current health insurance conversation would be if he had not delivered that knockout punch. Health insurance continues to be a political football. 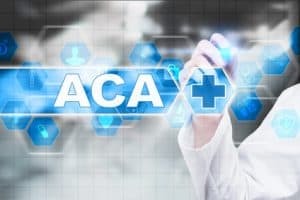 Popular talking points during the recent midterm elections included continuing to guarantee coverage for pre-existing conditions and proposals for “Medicare for All.” There is also continued uncertainty surrounding Cost Sharing Reduction which remains part of the law. Building an early retirement plan that relies on subsidies is rolling the dice on a precarious system. Things could change with the outcome of any election. Alternatively, ignoring subsidies could mean working and saving years longer than necessary. We need to find ways to balance these risks. Even if you’re comfortable with the political risks, a plan dependent on receiving subsidies means structuring your life around limiting your MAGI. It’s comforting to know that we currently have an option for nearly free health care if we couldn’t earn income. However, we need to determine what purchasing health insurance would reasonably cost while factoring in the lifestyle we want to live. In our case that includes continuing to earn some income. Health insurance costs for 2019 are based on 2019 MAGI. This requires projecting future income. My wife wants to continue to work. This will produce some earned income for our household. We can control some of that income counting against MAGI by contributing to tax-deferred retirement and HSA accounts. I will also make a small income from this blog. Most, if not all, of my income can be shielded from MAGI by contributing to a deductible IRA. However, we still have to produce income to live. A portion could come from dividends which already count towards MAGI. We could also sell shares from our taxable accounts. A portion of these shares would be cost basis, which does not count toward MAGI. The other portion would be capital gains, which would count towards MAGI. It is impossible to know how much would come from basis vs. gains. That would depend on the direction of markets until we would need to sell. Not knowing exactly how we’ll structure our income, it is difficult to determine exactly what our MAGI will be. Without knowing MAGI, it is impossible to know how much health insurance will cost. We chose $60,000 as an estimate of our 2019 MAGI. We entered this figure into the Health Insurance Marketplace Calculator to get a ballpark figure on our health insurance premium costs for 2019. Increasing our MAGI increases our health insurance premiums to $476/month for a silver level plan. We would still get a generous $925 monthly premium tax credit. This would more than double our current monthly expenses, but the tax credit keeps premiums reasonable. I next compared benefits of Silver level plans bought through the marketplace to our current benefits. The healthcare.gov site is not user friendly for window shopping. It requires creating an account and entering personal details before seeing plan specifics and pricing. The results I found through eHealth correlated closely with the estimated expenses and premium tax credits given by the Health Insurance Marketplace Calculator. The full unsubsidized costs of these plans, our personal share of premiums, and deductibles on these plans were all substantially more than what we would have if staying with coverage through an employer. Utilizing premium tax credits seems to be a viable strategy to obtain health insurance for someone with a small to moderate income from part-time work, a working spouse, real estate investments, a pension or other sources that count against MAGI. Again, this strategy also means accepting the risk that subsidies could change in the future. When planning on purchasing health insurance with premium tax credits, it is vital to be aware of “subsidy cliffs.” If your household income is greater than 400% of the federal poverty level, subsidies stop completely. Returning to the Health Insurance Marketplace Calculator, our family’s MAGI could reach $83,100 and we would pay $683 monthly premiums while receiving $719 premium tax credit. However, earning just $100 more would push us over the “subsidy cliff”. With a MAGI of $83,200, our subsidy would drop to $0 and our monthly premium would increase to $1,401. Making an extra $100 in a year could cost us $8,616 dollars in extra insurance premiums by pushing us over the “subsidy cliff”! This would obviously not be desirable. We looked ahead at potential sources of income next year. I’m planning to release a book in the first quarter of 2019. I have no way of projecting how much I might earn from the book. It is conceivable that I could earn enough money to push our household income over the subsidy cliff. I also am considering working 6-12 weeks as a traveling physical therapist in either 2019 or 2020. This would likely bring in $10,000-20,000 in income which could push us close to or over the cliff. Maintaining the ability to return to my career has been part of our plan as “health insurance insurance.” I plan to work a rotation every 2-3 years to maintain my skills and knowledge base. We don’t have a long-term plan for health insurance to bridge the 20+ year gap from full-time work until Medicare eligibility. The ability to return to my former career gives another option to get affordable health insurance if necessary. I would not be working because we need the income or because I have a burning desire to return to PT work. It would be ironic if this income pushed us over the subsidy cliff and cost us thousands of dollars in extra insurance premiums. Losing $8000+ in premium tax credit to earn $10,000-$20,000 would be an effective tax rate of 40-80% on that money, in addition to payroll taxes owed. Choosing to go out on the open marketplace to purchase health insurance could cost us anywhere from about $1,400 to $14,000 more than we are currently paying for health insurance. The benefits provided by marketplace plans are not as good as the insurance we would get through my wife’s employer for the next year. There’s a reasonable chance that we could exceed the subsidy cliff next year and be at the high end of those figures. We’re going to pass on buying traditional insurance through the open marketplace for at least another year. Our situation demonstrates the challenge of buying affordable health insurance currently faced by those who have earned income, business income, rental income, pensions, social security, disability or other income included in calculating MAGI. Planning is particularly challenging for those with variable income, due to the difficulty projecting MAGI a year in advance. The difference between the cost of subsidized insurance and the full cost of insurance demonstrates the variability that any early retirees need to plan for in case subsidies are discontinued or the system substantially changes. As shown with our example, we currently pay about $2,600/year for health insurance through an employer. Buying insurance on our own, our annual premiums could drop to about $1,000 if optimizing subsidies or go up to $17,000 if paying full costs. Modeling insurance for a couple in their early 60’s showed the variability was even greater. Premiums range from about $800 annually in an optimally subsidized scenario to $26,000 annually for a couple purchasing the same insurance policy without subsidies. I frequently share articles or write about non-conventional approaches to retirement such as semi-retirement, mini-retirements, one spouse retiring first, or investing in alternative asset classes like real estate or small businesses that may produce more retirement income than traditional paper assets. These approaches allow starting down the road toward early retirement sooner, with more income and more life options. However, having more income produces unique challenges to obtaining affordable medical insurance. Likewise, taking Social Security early or having a pension can produce income that makes health insurance far more expensive. Next week I’ll explore an alternative to buying insurance on the open marketplace. I’ll compare the costs and coverage provided by health sharing ministries. Will this option better suit our needs? Will we continue to rely on employer provided health insurance for at least another year? How are you dealing with the challenges and risks of obtaining health insurance? Is health insurance keeping you trapped in a job when you would otherwise retire or work less? I am always impressed by the level of knowledge and creativity shared by readers of this blog and look forward to reading your ideas, insights and solutions in the comments. That said, I understand political instability and risk is part of the challenge when planning for health insurance. Name calling and ideological rants are not helpful to anyone trying to develop a plan to transition to retirement sooner. Please refrain from making this a political conversation. There are thousands of other places on the internet for those seeking that. I reserve the right to delete or edit comments that don’t comply with this request. Thank you. Chris, I urge you to go a little farther in the enrollment process (without completing it, of course), to see the actual provider network that your ACA plan will pay for. If it’s anything like the one plan currently available in my area (Maricopa County, AZ), the network is so small as to be almost useless. Call your current providers and ask if they take it. Did your former employer take it? I think I know what the answers will be. You might dismiss that point and say that you intend to use ACA for catastrophic expenses, and would pay cash to see your family doctor, your favorite physical therapist, etc. Do you really want the hassle of being in the hospital and having to query every single provider that approaches you about whether they are in-network for Bubba’s ACA of Utah or whatever your plan is called? ACA is a real joke. It’s horrible insurance, and it’s “affordable” to almost no one. Even if it were worthwhile, the subsidies cut off at 4x FPL, which for a single person is only $48K per year. Anyone with even modest savings will blow past that number quite easily. You make 2 good points. In different areas there may be only one provider participating on the exchanges. In other areas there are many. I don’t think that is an issue in the area of Utah where I reside. It may in more rural areas of my state and I’ve definitely read that is an issue in different areas of the country. EHealth is an insurance broker that sells ACA compliant plans. I actually had a number of options, more than I was able to display on the screen shot. A second point about the affordability of the insurance on the exchanges. You are right that the insurance available to individuals comes with much higher premiums and deductibles than what we have available through group coverage available through an employer. This is why I urge people to look at the actual cost of premiums and plans, rather than focusing on what your subsidized costs are whether getting insurance through an employer or the exchanges. Re: catastrophic expenses, my point was that the ultimate purpose of insurance is to control downside risks in a worst case scenario. We do everything we can to not utilize the health care system any more than necessary. I agree that even now with insurance through my wife’s employer, we basically pay for everything aside from annual well visits already. I also agree that with higher deductibles on exchange plans, this would be even worse. You can shop gold or platinum plans for better coverage, but they are extremely expensive and if looking to use subsidies not as beneficial. The Kaiser insurance I buy through the ACA is the same insurance available outside the ACA through Kaiser, so its no joke. The ACA works just fine in Ca. Thanks for the feedback Mitch. As Larry noted in comment above there are great disparities in experience and options depending on geographical area. I spoke to a broker recently… although I’m not needing ACA anytime soon (I’m still working, and would plan to use up my 18 months of Cobra when I stop working), I want to stay on top of this stuff. Maricopa County will actually have 4 ACA providers selling plans for 2019. The broker cautioned me that this is not necessarily good news because the plans will all end us being basically the same. From browsing other FIRE sites, I have the impression that ACA quality can very quite a bit from state to state. However I’m not sure that the commenters who post on this topic, are the kind of people who actually use their medical insurance. Indeed, everyone needs to study this in detail, for their individual situation. We’re in CA and that’s our experience too, Mitch. My wife was paying $500/month for COBRA after getting laid off. She was reluctant to get on the ACA but she found a Kaiser Silver plan and only pays about $38/month. I’ve been on the Medicaid expansion for three years for $0/month. It’s basic insurance so you shouldn’t expect the hospital to want to give you fancy tests and drugs if you pull a muscle in your back (although I did get x-rays). I’m considering selling stock to get my income high enough to qualify for subsidies. I’m a “rarely, if ever sell” kind of investor so it’s hard to part with stocks but I will need to raise cash next year to live on anyway. The network for the ACA is large in Vermont. Also, most providers in NH and VT take Medicaid. I believe that age doesn’t factor into plan cost in VT either. The ACA is very state-specific as to how well it works. 1st, you are kind of correct that you can get quality care with Medicaid coverage. Approximately 70% of physicians accept Medicaid patients. Depending on where you live, you may have decent options or you may have none. More providers accept Medicaid for children, so this is a better option for kids. 2nd, this is where this personal finance decision becomes more personal than finance. I personally would have a hard time accepting Medicaid, which is a program for our most at need citizens when I am a 42 y/o healthy adult who could easily work to provide for my family if needed. This is not to say utilizing Medicaid is wrong, and it is certainly not illegal or fraudulent. It is just a personal decision. If you pressed me on what is different about Medicaid vs. optimizing subsidies, which are also in theory for at need individuals, I honestly don’t have a great answer. At some point, we all have to do what is best for our lives and our families within the laws that govern us. There are many facets to this conversation beyond the financial that make it challenging. I agree with you on Medicaid. If you can work you should get out there and get going. I just used that calculator and for a silver plan it is $ 15000 a year. Infuriating to say the least. Glad you said don’t make this a political rant because I was headed in that direction. This ACA is an absolute disgrace. Actually there is a 3.8 tax on investment income and a .09 tax to help pay the subsidies. BUT no one in the middle class is paying this, it’s only on those above $250,000. The number last year for a single was $200,000. I’m definitely “middle class”, but my investment income pushed me slightly above that line so I got hit by this. So be careful with your “no one”, Mitch. Larry, 62 % of the country makes $45000 or less per year. Your $200K is at least upper middle class wouldn’t you say? Chris, what makes you think I had a choice? If your income is below the line, you are “forced” into Medicaid, in the county I live in. You cannot opt in to ACA to support any personal virtue badging. Medicaid is not mean-tested, it is purely based on MAGI. I tried to talk the county out of it, because I was ok with the existing ACA bronze plan, but the alternative was to get fined for having no insurance at all (a couple of years back). So what you are saying above makes no sense: It is not a personal decision at all. For me it would be a decision. We could easily do Roth conversions to generate income that would count toward our MAGI. We also can continue to do some work that generates income. There is no requirement to do either. For us, but not necessarily for everyone, those are choices. That said, we would certainly be in our legal rights to not make those decisions, in which case we could qualify for Medicaid. Whether you have similar choices or not, I think I made it clear that I think as long as we are following the law we all have to decide what makes the most sense for our situations with the options we have available. I’m not passing judgement b/c it is not my place to do so. I take your point and hope the super rich are feeling guilty about their recent huge tax cut, too. For those of us that were old enough to remember the draft (especially if it came calling) planning for health care in retirement is significantly easier – just depend on the VA. Yes there are restrictions on who may be eligible and there may also be copays, but depending on the VA for health care before age 65 satisfies the need for coverage demanded by ACA. It doesn’t satisfy Medicare (Part B) so you may want to buy Part B when you hit age 65, it does however satisfy medicare Part D.
Those who retired from the military have the option of Tricare and those who served have the option of utilizing services of the VA. Most readers do not have these options. Except the VA is horrendous in some areas. While my wife, son and I are all vets – the VA is a last ditch option for us. Following is but one fairly recent example. Unfortunately, the majority do not sue and collect. I worked at a VA hospital for two years while attending PT school. I was also underwhelmed by the quality of much of the care provided there. It is unfortunate. I still find distasteful the idea of the subsidy going toward my insurance. I am taking that out of someone else’s pocket, a taxpayer. There is no such thing as government money. See reply to Ray above. I am one of those who has to monitor and manipulate my AGI in order to qualify for the ACA subsidy. It is easily done in my case because my AGI is from rental properties, capital gains, and dividends. I just did my analysis on where I stand this year and realized I have to create some deductions to qualify, so I will be doing some improvements before the end of the year. I also have the option of just lowering rents. It’s not the ideal situation, I have to spend $5000 in order to avoid a $12000 bill later. I don’t feel guilty at all about receiving the subsidy and here’s why. One, I have a pre existing condition and previously felt discriminated against. Two, and my main point is there are government dollars available to everyone. The are programs, tax credits, deductions, and subsidies for EVERY income group, from poor to filthy rich. We are talking about Government dollars regardless of what it’s called. A dollar is a dollar, still 100 cents, whether it’s for a farm subsidy, food stamps, a mortgage interest deduction, or a rich guy getting that subsidy for his corporate jet. I’m curious if you have any problem subsidizing the rich guys corporate jet? That’s a government dollar$, same as the one going to the food stamp recipient or health insurance subsidy. To not take what’s available to you is just nuts. If you can qualify for the subsidy take it because that government dollar is no different than the ones being taken for many other less justified reasons. Am I the only person here that looks with a somewhat jaundiced eye at the prospect of being compelled to pay income taxes subsidize the health insurance of people electing to retire as early as their 30’s? As noted in the article and in response to Ray’s comment above, there are many facets to this issue that make it complicated. That said, we need to understand the rules that govern us and learn to operate within them. What other option do we have as law abiding citizens? I concur with Ray – you shouldn’t dismiss Medicaid. We have used it the past 3 years, and find it has saved us thousands over even a subsidizing ACA plan (don’t forget – both employer-provided and ACA plans can involve a large deductible and/or co-pays, which need to be considered in total healthcare costs along with premiums). Our biggest complaint is that while we have many options for doctors that accept Medicaid, we have found no DENTISTS that take it! However, we have finally run out of our non-MAGI options (Roth IRA and 401k basis, already-taxed savings account deposits), so we will be looking for an ACA plan this year. I’m in my early 50’s and retired from a software business. My family is on ACA plans and we have several rental properties which provide solid cash flow while the depreciation on the rentals limits the taxable income allowing us to have sufficient cash flow and still qualify for subsidies. I have been shifting assets from stocks and bonds to real estate over the past five years as tax treatment is so much more favorable on real estate. That’s an interesting perspective Bob. I’ve been considering diversifying some of our paper assets to real estate for more diversification and higher income. However, the income would seem to be a drawback when it comes to ACA subsidies. If you don’t mind sharing, are your properties highly leveraged? Honest question, no trolling. Would you feel guilty taking the depreciation allowed on real estate or using the step down in basis to transfer the property to your kids when you pass on? (feel free to email me if you feel this is wading too far into philosophy/morality/politics. Thanks for all of your great info. It is a fair question Robert. See discussion with Ray above. I don’t know that I have much more to add beyond that. I retired in March 2017 at 59 and didn’t qualify for ACA until 2018 because I was already over the subsidy cliff. So I had to carry COBRA for the remainder of the year ($600/mo). I live in Austin, TX and surprisingly, we have several insurers that participate in the ACA. Being able to manage your MAGI to your favor is the secret! I retired with a large cash cushion and have used that to keep my cap gains, dividends and interest income down. It also helps that I’ve followed FIRE for years so my annual living expenses were already pretty low. In 2018 I got a $79/mo silver plan with a $2500 deductible. I ended up having shoulder surgery (slap tear) and several months of physical therapy. I had an excellent choice of providers and my out of pocket expenses were very manageable. For 2019, I’m raising my MAGI to give me room to take some capital gains. I’ve also decided to switch from a silver plan to an HSA eligible Bronze plan with the same insurer. My copy will go up to $5500 but that’s a manageable risk. The new plan will cost me 43 cents per month. I expect my out of pocket expenses to be the same this year as last so it made sense to me to move to a lower monthly premium (My current plan was going up 250%). What I’ve learned so far is that managing healthcare expenses is a year to year effort. I’m within 4 years of Medicare and the dems are in control of the House so I’m feeling pretty positive that I can make it to Medicare safely. I expect to continue to closely manage taxable income to maintain affordable coverage. That’s probably the only negative with ACA so far for me. Thanks for the feedback Rodney. Your experience illustrates an excellent point that I didn’t explicitly state in the post. Assessing the political risk of a change in the rules is far different for a 60 year old than a 40 year old. Most people should be able to adjust their plans for a couple of years if need be. If you can’t, you probably don’t have enough to retire early. For a more extreme early retiree like myself, the risk is far greater. Most people with ambitions similar to my own would need to either save far more than their current spending or mitigate risks by electing semi-retirement, mini-retirements, or another alternative as we are pursuing. 1. ACA has a special definition of MAGI that is in your favor. Don’t just look at the standard definition. Only for purposes of ACA is MAGI reduced by IRA contributions. When I am at risk of going over the cliff, I can decrease my “MAGI” by 13K by moving money from my bank account to an IRA. Very handy. 2. If you do go “over the cliff” just a bit, it isn’t quite as bad as it seems. You then qualify for Catastrophic plans no matter your age (which are fine if you are fairly healthy) and which are MUCH cheaper. 3. I hate to say it, but if it comes to it, I won’t work except under the table at this point. ACA killed a perfectly good Catastrophic Health Insurance market that my wife and I were counting on for early retirement. I feel guilt-free. 4. Don’t forget the dentist…an implant with a sinus lift is 6-8K. Unfortunately, I know. Thanks for sharing your insights and experiences. Regarding your point 3, I want to be very clear that I would not encourage anyone to break any laws or commit fraud. That said, I understand your frustration with the law and I have similar frustration seeing the potential penalty we would face for making just a few dollars extra that could push us over the subsidy cliff. As you note, the law essentially made ACA compliant plans the only legally binding insurance option we have. We therefore need to learn the rules and utilize them to to protect ourselves from the massive risk that comes with an adverse health event. Medical expenses are the leading cause of bankruptcy in this country. I am right in the middle of applying for the ACA for 2019. My wife’s COBRA benefits end on Nov 15, or in 3 days. Here are a few points about my experience in getting her signed up. 1. There is a way to access the plans and likely subsidies without logging in. 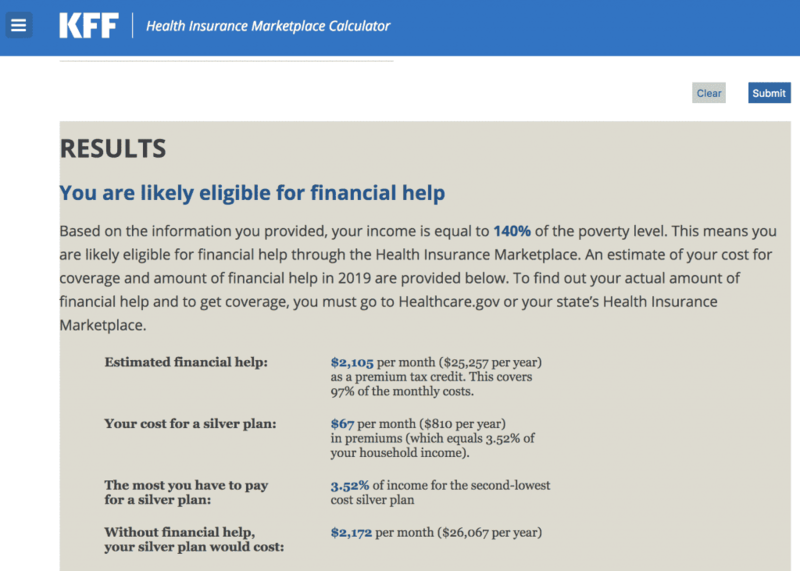 When you get the the healthcare.gov website, scroll down to the box, Quick Start Guide. Go down to tip #5, preview plans without logging in. 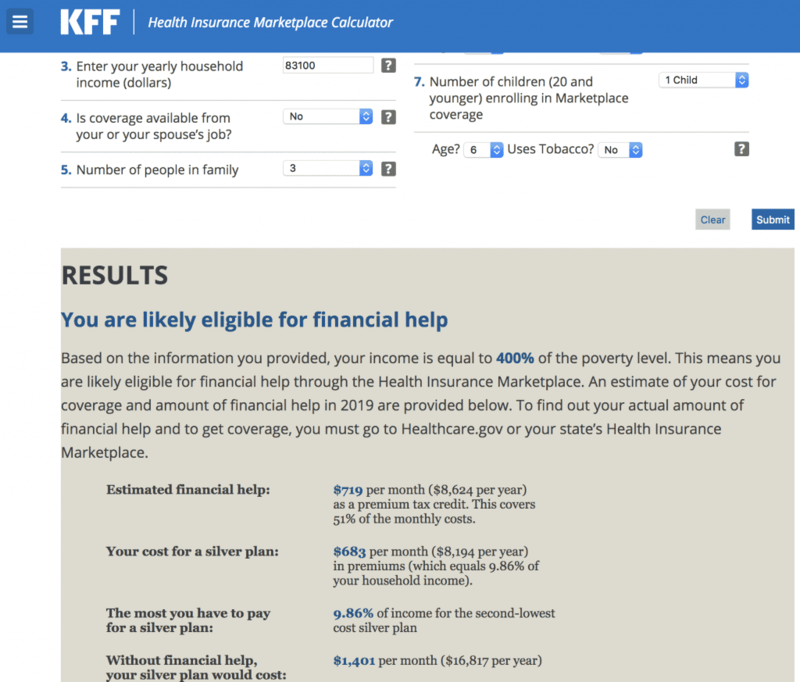 If you are interested in finding out your subsidy, you will have to feed in some information anonymously, but no more than you would if you used the Kaiser calculator. One would think that the powers that be would put that information right up front; I mostly found it by accident. 2. You have to provide documentation that your health benefits are ending and you have no alternative healthcare available to you. I did this 3 weeks ago, called to verify that they got it, but still no word. So give yourself plenty of lead time. 3. Our COBRA coverage ends in the middle of the month, but you can only sign up for ACA coverage at the start of the month, so we had to find pricey “bridge” coverage for the 2 weeks between Nov 15 and 30th. 4. I am applying in Nevada. There are fortunately 13 different plans to choose from, but the main difference between plans is that the lower the premium, the higher the deductible, and vice versa. In addition, they are all HMO’s, so you are limited to a range of providers in the local area. Some plans paid nothing for doctor visits, drugs, lab work, or x-rays until the deductible, around $8,000 was met, but in this case we were able to choose a Bronze Plan that did have co-pays for these services that did not require that the deductible be met first. 5. 3 meds my wife uses were not in ANY of the formularies, i.e. the covered drugs under the plan. An extremely useful site I am using, GoodRx (they are advertising pretty heavily on TV now) will tell you what all the pharmacies in your area are charging; this was really an eye opener, because there is a large range in the prices. I discovered that it would in most cases it would be less expensive using the coupons provided by GoodRx than paying the co-pays. That knowledge allowed me to pick a plan based on the other parts of a plan that we wanted without considering the possible drug costs. 6. I would like to weigh in a little on the “subsidy” question. I will be taking a subsidy to decrease our costs and I have no hesitancy in doing so. Would anyone not take the mortgage interest deduction? Would anyone pay capital gains taxes even thought their income was below the necessary level to trigger them? These are just subsidies by another name. One man’s loophole is another man’s just taking the deductions that our unbelievably complex tax code that we (still!) have to deal with. Thank you for these helpful tips and insights. I’ll definitely try that with healthcare.gov. I could not figure out a way to get that level of detail without entering all of our personal information and creating an account. I second your point #6. Great article. I have been analyzing our ACA options in depth as we will be retiring early next year at the ages of 51 and 55. It was great to read your review and confirm much of what I have learned. Here are some additional things for you to consider. *make sure your doctors are in network. We could get a much cheaper policy, but we decided it is far more important to us to keep our current physicians. A great website for getting estimates is HealthSherpa – very user friendly, and you can enter your doctors and filter the plans to only those that accept your doctors. I highly recommend it. We also plan to use a broker when we actually sign up in 2019. I have been told it makes the process MUCH easier. *also be sure to check if the policy has a national provider network or at least out-of-network coverage. This will be important if you plan to travel a lot – some policies only cover emergencies. It is also very important should you develop a serious illness and wish to get a second opinion or perhaps even treatment at special facility like a national cancer center. *also be sure to think about how much control you want with your healthcare. We ruled out HMO options that were much cheaper because we didn’t want a gatekeeper situation and increased difficulty getting tests covered. *Note: I have been told you can reconcile premium charges at tax time without penalty if you underestimate your income (although you do need to beware the cliff, since as you know that will cost you A LOT!). I have read you are not required to reconcile CSR’s (confirm this). So, it is better to underestimate your income than overestimate if you plan on utilizing CSR’s in addition to premium subsidies. You can always pay back at tax time anything you owed towards premiums if you go over your estimated income for the year. *if you develop a part-time PT practice (work as an IC for someone or see your own patients for cash pay or as Medicare only provider, working only when you wish), you can deduct your health insurance costs. This allows you to directly make income that pays for your health insurance without increasing your MAGI. The calculation is circuitous, but can be estimated (I have a link somewhere as to how to do this!). You can also put any extra income into a Solo 401k, a SEP-IRA, or a Simple IRA so there really shouldn’t be a problem worrying about going over the MAGI limit unless you make massive coin. The maximum amount a self-employed individual can contribute to a solo 401(k) for 2018 is $55,000 if he or she is younger than age 50. Individuals 50 and older can add an extra $6,000 per year in “catch-up” contributions, bringing the total to $61,000. Sooo…that takes away that concern you have right there. P.S. I’m a PT and have set up my own private practice for the same reasons as you; I plan to work several weeks a year to keep the skills fresh, just in case the ACA goes away, and I would need to return to full-time work (shudder). I will only see a few patients a year (if that). I plan to see them in their homes under Part B (outpatient therapy in the home) or for cash if they are under 65. So my overhead will be incredibly low. It was a real pain to get my PTAN with Medicare, but so worth it. I did it myself so no fees paid to anyone for that. Thanks for taking the time to comment. Those are all great tips. Regarding your last point, I’ve been thinking about options like a Solo 401(k) and other efforts to limit income, but it seemed unnecessary, even silly, since I have virtually no income at this time. I hate adding complexity to my finances. My initial thought was if I have to pay a little more for health insurance b/c we’re doing well in a given year, it is well worth it to keep things simple. But seeing the actual numbers of going over the “subsidy cliff” is making me reconsider this position. I greatly appreciate you sharing your experience as a PT and I may consider doing something similar. I can’t help but laugh about your shudder at the thought of returning to full-time work just to get health insurance. It’s so ironic that our broken healthcare system is the reason I wanted out of that career, and now it is my biggest headache in “retirement”. Ugh! Wrt rental income; can you deduct the depreciation/expenses to determine MAGI for ACA subsidies or not? Hey Chris – welcome to the ACA MAGI game. You are right about the cliff re losing subsidies. We are self employed and set up an LLC for our business. That allows us to have Individual 401K plans for deferring income as well as you can assign to the LLC the portion of healthcare premium which isn’t reimbursed by the subsidy – it shows up on Line 28 of the 1040 and helps to reduce your MAGI. 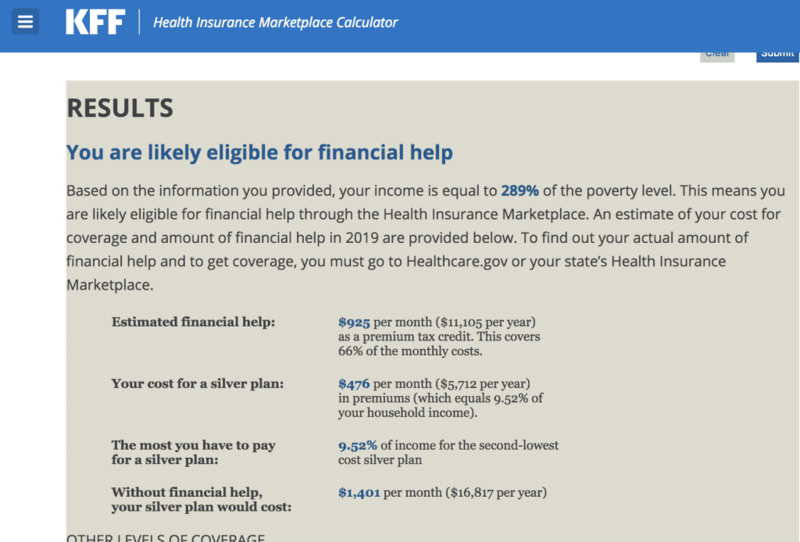 (it’s a somewhat complicated iteraive calculation, but Turbotax Business software does it fine) Also funding an HSA will reduce your MAGI provided that your ACA plan meets the IRS definition of ‘high deductible’ – note that not all plans with what seem to be high deductibles meet this criteria as the plans are managed by HHS. We are in our 50’s and healthy so with a high deductible plan end up paying most of any minimal annual required treatment costs, but have the insurance to protect from ‘downside risk’ – not ending up with a $250K bill for a bike accident, etc. Great comment. See Lorraine’s comment above for more on this idea. Most years, I wouldn’t anticipate having much income so it seems like more hassle than it’s worth to set up LLC’s, retirement plans, etc. I crave simplicity in my finances and so hate this whole topic. However, I’m not completely sold on health sharing ministries yet and so I may end up going down a similar road to what you and some others are suggesting. reducing the MAGI. Oh, what do you mean by ‘premium tax credit’. There are essentially two types of tax credit/subsidy available when purchasing ACA insurance. I have links with definitions of both in the post. The premium tax credit is a credit applied toward your health insurance premium. This is what I emphasized in the post. The cost sharing reduction is a second tax credit applied toward copayments, coinsurance and deductibles. The CSR is only available with Silver Level plans, and only for those with incomes high enough to not be on Medicaid but below 250% of the Federal Poverty Limit. There is also uncertainty about these credits because they are currently not funded. Hope that clarifies. Good article, especially regarding the cliff and impact of taking Social Security early. In addition to the cliff, it’s interesting to note how the mere structure of the subsidies create a higher “tax” rate (combining impact of Federal income + loss of subsidy). On an annual basis, for every $1,000 of income, you lose *approximately* $130-$150 in subsidy, or about 13% – 15%. So if you’re in the 12% bracket, your “effective rate” is more like 25%-27%; if in the 22% bracket, more like 35% – 37%. 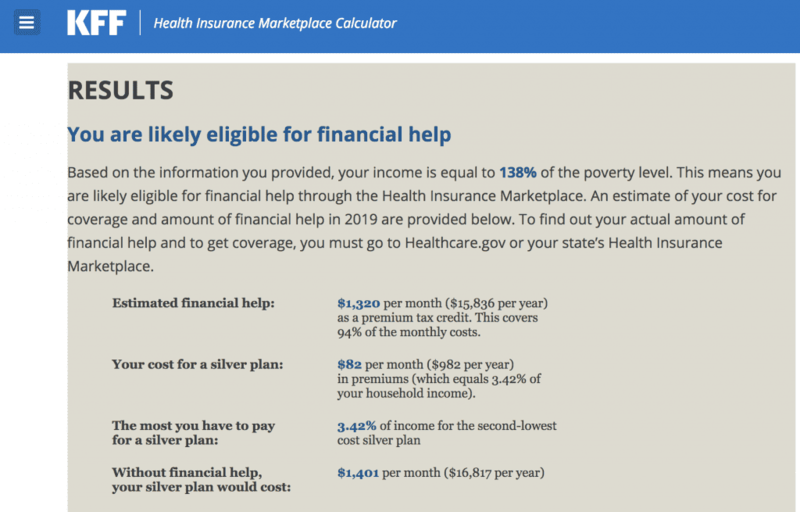 It’s also worth noting that not all marketplaces may offer a Silver plan that is HSA compliant; where I live, on the Federal exchange, HSAs are only available on Bronze plans. So my decision is to take the more generous benefits of the Silver plan, or forego that in order to contribute to an HSA. I’m currently leaning towards the Bronze/HSA. Interesting about the lack of Silver plans that are HSA compliant. I hadn’t seen or heard that. I still don’t fully understand what makes a plan a high deductible plan compliant with use of an HSA. As noted, the plan we have through my wife’s employer allows us to contribute to an HSA, where some of the exchange plans available to us in Utah have considerably higher deductibles but are not HSA compliant. I’m guessing a lot of people with the focus and intensity needed to arrive at financial independence are finding what I did and just not commenting here. That even doing a relatively small amount of fun side gigging is pushing me way over the limits that allow subsidies. But that’s not a problem since I don’t need the income anyway, so what if I spend $16,000 of it on health insurance. It is basically extra money since I’m doing the consulting for entertainment. No Steveark, that’s not it at all. I have the financial independence to afford $16,000 a year for health insurance. I might grumble about the cost but I will not go without it. The problem is that the $16,000 does not buy _good_ insurance. It’s insurance that virtually no doctors accept in my area. Other options like the sharing plans, are on shaky ground. Insurance that I consider acceptable and worthwhile, is currently not available to me, at _any_ price. So I stay at my job, just for the insurance. I’m trading time to my employer that I’d really like to be using for other pursuits, and to improve my own health. it makes no sense. You make an interesting point. I would not consider myself cheap (though I’m sure some would disagree), but I do make spending decisions based on value. I just have a hard time spending $17,000 for a plan that is inferior to a plan that we currently have for $2,500. I also find it hard to swallow the idea of doing anything to make money when it means I have to pay $17,000 for the exact same product that I could get for $1,000 if I didn’t do anything productive. I’m honestly not sure why I feel that way, but I do. I think part of the reason that idea leaves such a bad taste is having worked in healthcare, I see how many of our healthcare dollars are completely wasted on unnecessary and even harmful services and treatments. I have no problem giving away money to causes I believe in, but I can’t stand spending money on things that I don’t believe in. Our health care system falls into the latter category for me. can I still contribute to an IRA? Not if you’re single. If you are married filing jointly and have a working spouse you may be able to. I retired when I was 58. Used Cobra for 18 months (what a waste of money). Have used Medi-Share for the last year. Luckily I have few medical issues. People should seriously look into using a Christian based healthcare. Thanks for sharing Carla. I’m actually in the process of researching them and writing about them. A person with “few medical issues” might foolishly consider Cobra “a waste of money”. I can get my Cobra for $500 a month – real insurance, with a real network and real coverage – and I’d consider it a steal. I could lock into it until Medicare age, I’d quit my job today. But I can only get it for 18 months. And a person with “few medical issues” might think the sharing plans are a good deal. Cheaper than Cobra, right? Well, the true test of any insurance is what happens when you actually need it. Sharing plans are not insurance and answer to no one. They are not insurance, which means that you the patient are “cash pay” with every single provider you have to deal with (good luck with that), and the sharing plan reimburses you. They are funky about pre-existing conditions, and don’t cover prescriptions. In theory they seem like exactly what insurance should be: people pooling their money to manage shared risk. But under the hood, they seem like a mess to me. Chris, if you’re researching them, please make sure you talk to real people who’ve had real expenses to deal with. I agree that COBRA is the best option for many people in the situation you describe. I actually had a short discussion in this post about that, but since I was focusing more on long term planning cut it b/c the post was already so long. As you note, COBRA is only a short term solution even for those for whom it makes sense, lasting for 18 mos. typically and 3 years at maximum. Also you share my concerns with HSM as I’ll be sharing shortly. Another option, retire overseas until you reach Medicare age and just buy into that country’s system which should be much much lower than full blown ACA non-subsidied premiums. A few years ago, I would have thought the idea sounds far fetched. I’ve talked to enough people doing it to know that medical tourism is a real and viable option and it is actually on my extended list for future blog posts. This is a well-written article and it summarizes the issues well. I have personally contacted the governing agencies involved to try and get answers to some of the information that you have provided and was given conflicting answers by different representatives (How they calculate MAGI, for example.). Frustrating not to be able to know the rules. Can you give me a simple example of what you mean when you write the following (Regarding the use of basis in taxable accounts.). Does this apply to 401s, 403s and traditional IRAs? Agree Bill that the process is complex and answers are hard to find. To your question. In a taxable account, if you invest in broad (total domestic or international market, S&P 500, etc) index funds, you should have little to no interest or capital gains (because there is little to no turnover of securities in the fund). You only have to worry about taxation when you sell shares. A portion of your sale is basis, the amount you purchased the investment for. You already paid income tax on this money prior to investing it, so it is not taxed a second time. The other portion is capital gains. This is “income” that is taxed at capital gains rates (short term if held for < 1 year, long term if held for >1 year). If you have a different investing strategy, this process becomes more complex. In a 401(k), IRA, 403(b), etc, you never paid income tax on the money (thus why they are called tax deferred accounts). When you W/D money from the account, the full amount taken out is subject to taxation at ordinary income tax rates and the full amount counts toward your MAGI. To go one step further, where a Roth account is nice in this regards (but not advantageous in other regards), is that you have already paid income tax before contribution and future growth is not taxable. Thus, any money taken from a Roth is not taxable and does not count toward MAGI. There are also ways to take money from a Roth prior to traditional retirement age without penalty which is another reason to have some Roth money. Hope that makes sense and clarifies rather than further confuse things for you. What Chris is saying is that if you have investments like stocks or mutual funds in an after tax account you could sell some investments and only the gain counts toward your magi. The rest is return of your initial investment (cost basis) and therefore not taxed when you sell the investment. For example if you own a stock that you paid $2500 for (the cost basis) and you sell it for $4000 (net proceeds) you have a gain of $1500. Only the gain of $1500 is subject to federal tax, the rest is return of your investment cost. Since only the $1500 is taxed, only that amount is added to magi. You net $4000 of cash to cover expenses but only increase your magi by $1500. Also keep in mind that if you are in one of the lowest two federal tax brackets your gain will likely be tax free but it will still be counted toward magi. If you are drawing funds from a pre-tax account (401K, 403B, 457B, traditional IRA) the entire amount withdrawn will be taxable and included in your magi. If you are withdrawing from a Roth retirement account the entire withdrawal will not be counted toward magi. If you have an IRA with both deductible and non-deductible contributions in it the withdrawal will be partially taxable and that taxable portion will be included in magi. Thanks for the clarification Mary. Thank you Mary and Chris for the clarifications. John: Net rental income is the only thing that shows up on the first page of the 1040. The depreciation and expenses related to the rental property are taken on the Schedule E. If the ACA MAGI only includes figures listed on page one, you should be able to use your net rental income which has already had the depreciation and expenses subtracted from it. My husband retired at age 63 in 2015. We were able to keep his company insurance until January 2016. He accepted a consulting job starting in 2015 and going into 2016. Because he didn’t know at the outset how long the consulting gig would last, we overestimated our income for 2016 and ended up paying the full ACA freight. It was enormously expensive–if I recall correctly, we paid around $1700/month for the two of us. We ended up getting a tax refund of $8000, but even with the refund that came to over $12000 for the year. We were able to get his income down as low as possible by opening and contributing to a Solo 401k, making the highest possible HSA contribution, and using the deduction for self-employed health premiums. That calculation, as others have pointed out, is a little tricky–however, we were able to get through it with tax software. In 2017 he did not consult but his pensions started. He collected the pensions for only half the year; they are not that much and the only other income we had was dividends/capital gains. We chose a silver plan because we supposedly qualified for the cost sharing subsidies, but I never saw any evidence that they kicked in. We also got a premium subsidy of around $1000/mo, but we were still paying about $400 a month for the ACA insurance. My husband went on Medicare in May 2017 and I continued with a silver plan for the rest of that year. In 2018 I wised up and got a bronze plan. Because our income is low enough, we now have a full subsidy and pay nothing for me. I will continue with the bronze plan in 2019 until I go on Medicare in June (thank goodness–can’t wait!). I am very grateful that ACA insurance is offered, but it is a lousy product as it stands now. The year we paid over $20,000 with a deductible of around $5000, we felt like we were paying enormous amounts of money for a plan we couldn’t use. Since then the restrictions have gotten worse and the full price has increased. While we are no longer paying the ridiculous premiums because of the full subsidy, none of my doctors are in the network (this is BCBS! But they still have a very limited network just in this area) and the deductible is over $6000. I worry every time I travel, even to see my son who lives 2 hours away in the same state, because I am not covered outside this immediate area except for emergency care. But what constitutes an emergency? If I have a car wreck and I am taken to an emergency room and then moved to an ICU, will the ICU charges be covered or just the emergency room charges? What if I can’t be moved for several weeks? I called BCBS with these questions but the rep had no answers to my questions. We looked into the cost sharing ministries run by religious organizations, and that was an unpalatable alternative for us. You had to swear/prove that you attended church regularly and there was no guarantee that your medical bills would be covered. I think the process with most of them is that you submit a bill and a committee decides if the charge will be paid. That was too iffy for us, as I have had cancer and my husband has high blood pressure. At least with the ACA, I know what to expect in the way of coverage. My advice would be to look at your situation and if you think you will be using a lot of healthcare services, consider a silver plan. If you are pretty healthy and probably won’t need extensive care, look at the bronze plans. The premium subsidy will cover much more with a bronze plan and the deductible is very high with a silver plan also, so unless you have a catastrophic situation you will probably be paying out of pocket for your healthcare no matter which type of plan you have. Keep your income as low as possible using all means possible–deferring income, deferring stock sale gains, taking stock losses, contributing to tax-deferred retirement vehicles and HSAs (and make sure the plan you choose is HSA eligible–in our state, there are only about 3 that are). Take all legal expenses for rental and self-employment income. Wow. Great comment Kay. Thank you for taking the time to share your detailed experience and insight which will definitely help me and many others with similar scenarios. 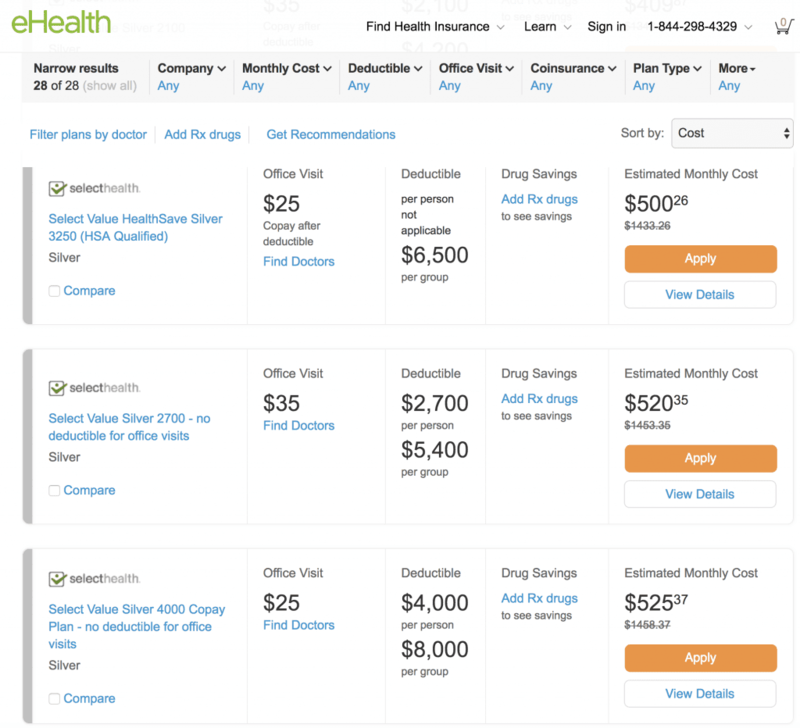 Really excellent review of the ACA “scenarios”…. I look forward to your deep dive into the Health Care Ministries (HCM). Thanks for sharing Thomas. This is one of the challenges I’m trying to wrap my head around with health sharing ministries. In an ideal world, they are much more aligned with the way I think the health care system should work. But we live in the real world, not my fictional ideal world. At the end of the day insurance is all about risk management, and health sharing ministries are not insurance. I admit I felt a bit guilty writing this post as you are one of the few people I know with a better situation than we have. There is a trend for companies to not even cover employees who work full time. We have the extremely fortunate position of getting excellent and affordable coverage for our entire family through my wife’s employer as long as she continues working at least 30 hours/week doing work she enjoys with flexible hours and location independence. This is part of the reason we’re thinking long and hard before making a decision to give that up, and I know from our recent conversation at FinCon that you appreciate that as well. Excellent post, Chris! My husband and I, along with our young adult daughter, are covered through our state’s health insurance marketplace. Anyone with a variable income who finds it difficult to nail down an annual projection for their MAGI needs to be very aware that the accounting for subsidies occurs at tax time. If you reduce your monthly premium by using all or a large part of the subsidy available to you during the year and then find that your income projection was on the low side, you’ll need to “pay back” the portion of the subsidy that you ended up not being eligible for. Because, as your examples illustrate, that can amount to thousands of dollars, serious thought should be given to the tax consequences of a subsidy in order to avoid a surprise at tax time. Our state’s health insurance marketplace allows an individual to elect (on an annual basis) any percentage of the subsidy one is eligible for and apply it to his/her monthly premiums. For example, if I were eligible for a subsidy of $500 per month, I could apply all of that $500 to my monthly health insurance premium to bring it as low as possible or I could apply none of the subsidy to my premium and plan on getting whatever I’m eligible for back at tax time. Or I could pick an amount in between. I do like this helpful option but, again, the important point to be aware of when choosing to accept a subsidy is that you may be required to pay it back in full or in part depending on whether or not your actual income for the year exceeds your projections, and by how much. This is excellent advice. Most people in this community have the money (on paper) to cover the full cost of insurance, but that is not the same as being able to easily produce and extra $10,000 or even $20,000 on demand which can be the difference between the subsidized and actual costs of a plan as my examples showed. This is something that should be carefully planned for by those planning to use the subsidies. Thanks for sharing! A typically excellent post Chris and I’m equally impressed by the thoughtful comments. 1. Without getting explicitly political, I do want to say that if one expects to be dependent on some combination of Medicaid and/or subsidized ACA plans choosing not just one’s state of residence but city is vitally important. Many states that have signed on to expanded Medicaid (my current one of Arizona is a classic case-in-point) are doing all they can to limit access by imposing work rules and even (in our case here) a 5 year lifetime limit regardless of age. Others (New Mexico, which I know very well, comes to mind) are in the opposite camp, looking to maintain access as much as they can, knowing full well that their mostly-poor population would be in open revolt if that safety net were monkeyed with. We’ve been on both Medicaid and ACA plans in Colorado, New Mexico and Arizona over the years. It’s pretty much the same doctors and clinics in both cases. All other things being equal we’ve found it to be worth the minor hassle and additional expense to manage our MAGI (we live solely off of investments) to keep it in the ~$25K a year range that gets us (married filing jointly) out of the Medicaid income range and into the maximum subsidy one for ACA. It is of course a year-to-year thing. Last year we were down to exactly ONE ACA insurer in Pima County (Tucson) and Maricopa (Phoenix) also had only one provider so things were really looking tenuous! One has to just live with the uncertainty and have a plan A, B and C.
Another advantage of living in Arizona, New Mexico and the like is being within an easy drive of a walk-across Mexico border crossing so as to be able to have easy access to quality dental work at a tiny fraction of U.S. costs. This is such an entrenched thing here that there are buses full of seniors (known by some as the “Margarita and a Crown Express”) that go to some of the smaller border crossings weekly so folks can walk across, get their dental work done and prescriptions filled and have a nice lunch afterwards with a margarita to address any remaining discomfort post-novocaine. I’ll let people draw their own conclusions about what this being a viable option says about the state of our health care system. Paying out-of-pocket in Mexico as an expat is certainly a viable option and if one has permanent residency status buying into the national health care system (IMSS and/or Seguro Popular) is also affordable. I won’t go into all of the details here, but suffice it to say that not only cost of care (~$25 to see a doctor, $40 for a specialist, $25 for a dental cleaning, $50 for a filling, etc.) but quality of care and access to it (1-2 days to see a doctor of your choice, no red tape, no nurses or PA’s just the actual doctor and they come to your home for the same price) are an entirely different world than anyone except the one-percenters have access to in the U.S. If it were just a question of health care there are a dozen lower-cost destinations one could move to that are light years ahead of the U.S. in that one area but full-time expat life is a realistic option for only a very few people. A last note on that topic is that anyone thinking about such a move needs to be aware that the combination of demographics (baby boomer retirement) and politics in the U.S. has caused most well-known expat havens in Latin America and lower-cost areas of Europe (Portugal, Spain) to be so over-run with expats in the past ~2 years that rents are through the roof, visa policies are in the process of being changed and local’s resentment of the effects has become a real issue. I am confused by your claim (and others) of having very low MAGI, simply because you “live solely off of investments”. My non-retirement assets (i.e. outside my IRA’s and 401k) produce about $50K of qualified dividend income per year. I’m reinvesting it, but it counts in MAGI, so I’m already over the ACA subsidy cliff for a single. And that’s without selling any assets. Am I misunderstanding your claim that you live on $25K income? Or is your actual income much higher, and your (dividends + capital gains) are only $25K? Thanks for any clarification and I hope this is not too nosy. You obviously don’t have to divulge this info, but would you mind sharing your investment strategy and asset allocation? If you get 2% yields on a total market index or S&P 500 fund (it’s actually not that high), that means you would have $2.5M just in taxable investments to produce $50k qualified dividend income/year. As a single person, that alone would allow you to take $75,000/year if drawing a conservative 3%/year or $100,000 if taking 4%/year. If this is a challenge, it may be worth looking for ways to lower your annual expenses (ex. — pay off mortgage, don’t carry car payments, etc). If you have a different investing approach that produces that much income, it may be worth looking at asset location (assets producing higher income placed in tax sheltered accounts, using broad index funds in taxable accounts). If not maxing out tax deferred accounts it may be worth doing that so not so much going to taxable investments and more is shielded from taxation. If doing all of those things to develop a sound financial and tax plan, then it sounds like you’re doing very well and maybe it would be wise to step back and ask at what point you have enough. This is a tough question for each of us. It can be tempting to think we always need more, but sometimes we can be trapped by having and needing more. It’s a deeply personal issue and decision, but may be something to think about. Chris, answering your questions in random order. Yes, I have “enough”! And have for several years. I live inexpensively, lack for nothing, and have no debt. Tax deferred options have been maxed out for my entire career. But – will you sell me good health insurance? That’s where I hit the wall. I will not go without it – I got into an argument about this on another site where the regulars urged me to “take a chance” and “live life to the fullest”. No, not when an accident or a random diagnosis of who-knows-what could easily bankrupt me. An individual simply cannot buy good health insurance. My investment income is from qualified dividend on individual stocks (common and some preferred) with an average yield of a little under 4%. Stocks are selected based on the historical increases of their dividends, many having a track record of over 50 years. This is a variation of the 4% Rule but I “never” need to sell anything, and the income stream grows each year. It requires some monitoring, but really not much. No index funds, which own a lot of stuff that I don’t want to be in. Some mutual funds that I’ve owned since the 1980’s but haven’t added to since I adopted my stock-based approach. As soon as I find the site which will tell me how to get good health insurance, I’ll be out the door of my job before anyone notices that I’m gone. Makes sense and thanks for your candor. I wish I could help you with a solution, but the only other thing I can think of goes back to Kevin’s comment and say you could always vote with your feet. Would you be willing to relocate to another area that has better insurance options? Certainly understand your frustration. Hi Larry – last year we had 10K in dividends and 2K in taxable interest. 50:50 equities to fixed, with the stocks all in index funds and bonds all short-term treasuries and treasury MM funds. Very insightful comment Kevin. I fully appreciate that there is a political component to this conversation and know it can’t be ignored. While we are taking different paths at this point in time, our thought process and approach of learning the rules and using them to make the best of a bad situation is 100% in alignment. Thanks for sharing your ideas and experiences. When is an out of pocket maximum not an out of pocket maximum? When you run into balanced billing. I’ll give two examples; the first one real. A friend had surgery at in in-network hospital done by an in-network surgeon. The doctor insisted on using robotic surgery and it was not approved by the ACA plan. My friend had a $5K out of pocket maximum which she paid. She was also balanced billed for $11,000 for the use of the robot for a total of $16K out of pocket. Second example. Go out of network; say to Mayo Clinic to treat some rare cancer. Your plan will pay the in-network fee for each treatment and the patient is balanced billed for the rest. Balanced billing does not apply towards the out of pocket maximum! Lesson. In a bad situation, your out of pocket maximum might not be what it appears to be. I haven’t figured out if this applies to emergency care as well. But I can imagine being on the other side of the country and needing emergency treatment from an accident or a ruptured appendix. The hospital fixes you up and charges you the “street price” for surgery and your insurance pays the negotiated rate in your home city. For many of us early retirement is about traveling and freedom. So this is something I need to research further. You’re absolutely right Pete, but I have no idea how to factor things like this into our decision. Even more challenging than the scenarios you describe, you can go into a hospital in your network, have a consult ordered and be seen in the same building by a contracted physician who is not in the network and get stuck with a big out of network bill. I think the fact that the system is so complex and broken is why I have such a hard time paying any more to be part of it than is necessary, even if can “afford” it. As I have been saying, the quality of an insurance plan is not in how much it costs. Well, of course in a way it is… but most people look at the cost of the premium and maybe at the deductible, and pronounce a plan to be “good” or “bad”. The quality comes from the number of providers who take the insurance as in-network and don’t play games with balance-billing. Our insurance at work uses Blue Cross’s provider network, which almost everyone accepts without question. I refuse to quit my job and pay much much more out of pocket in premiums, for insurance that almost no one takes. It’s infuriating. Hi Chris, thanks for the excellent insites. I semi-retired at 59 3 years ago (and am fortunate enough to be covered in the VA Healthcare system which in my experience has been terrific). For my wife we have managed to keep my part-time income plus her very part-time income plus our IRA withdrawals totalling under the 400% of MAGI. One trick has been to be able to contribute “back” to a traditional IRA if we overshoot our income. Another is by selecting a Bronze High Deductible Plan we have been able to contribute to an HSA each year. So far it has worked extremely well. For 2009 we are getting premium subsidies of $1,222/month and are set to pay only $1.96/month by keeping our income at around $64,000 using standard savings account as a “source” if we underestimate our income this year, and the IRA as a target if we overshoot our income. The HSA contribution also reduces the MAGI. It is a sweet deal while it lasts! Thanks for sharing John and glad to hear you’ve found a solution that is working for you. I plan on early retiring in a few years. I plan on living on 12k a year. That would be put under the poverty level which would qualify for Medicaid. But I have assets. I’ll have a paid off house and money in retirement and savings accounts. I was under the assumption that you cannot qualify for Medicaid with assets. If I qualify for Medicaid, that’s great. But what if I don’t? Is my best option to pull out more than 12k just to get the subsidies? Pulling out more than I need would cause a tax increase and honestly money I wouldn’t need. I won’t have any earned income and the money would be coming from an IRA conversion every year. I’m single, no kids, live in Nevada, will be in my 40s and should have a paid off house by then. Any advice? Qualifying for early Medicaid is income driven, not based on personal assets. I retired early and, after COBRA, was on the Medicaid program for a year. But, similar to what Chris said in an earlier post, I felt that program was for the truly needy and have since switched to the ACA HSA Bronze plan in my state. A. Noonan Noose at Frugal Fringe has some excellent, specific articles on managing your MAGI to optimize healthcare premiums and ROTH conversions. I understand totally Larry’s comments about the type of care in these situations and trust my excellent health continues so I don’t have to find out. Thanks for chiming in Jim. The only thing I would add is if doing Roth conversions you could just convert more, still at a relatively low tax rate, to generate the additional MAGI to get you to 400% of the poverty level and then use a Bronze plan which should be close to free or a Silver plan which would get generous premium subsidy and cost sharing reduction with an income that low. You certainly have great options, assuming you want to live on that little forever. Thanks Jim. Thanks Chris. Great stuff! Good article. Please note that the price can drastically change. For 2018 I was very close to the 400% FPL and my premiums were $0. This year for the same plan and approx the same income level my plan costs went to $523. The plan coverage is also not as good.